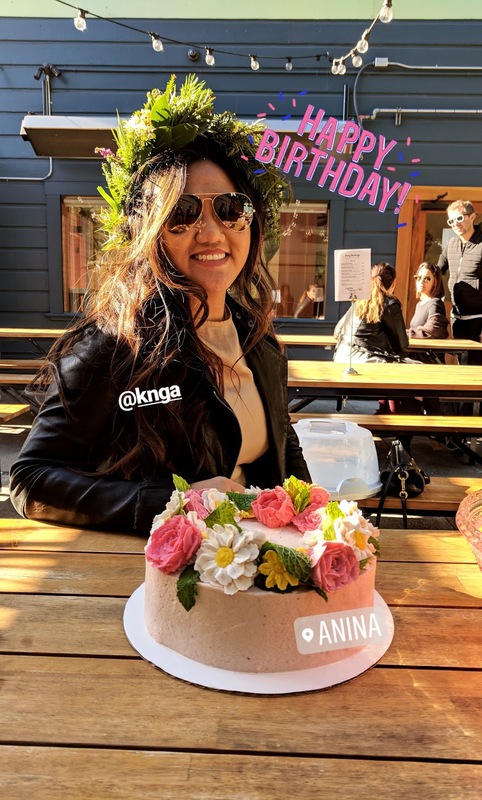 tl;dr - Inspired by Snapchat's flower crown filter, I baked a strawberry cake with hand-piped bean paste flowers for my friend Karen's birthday. 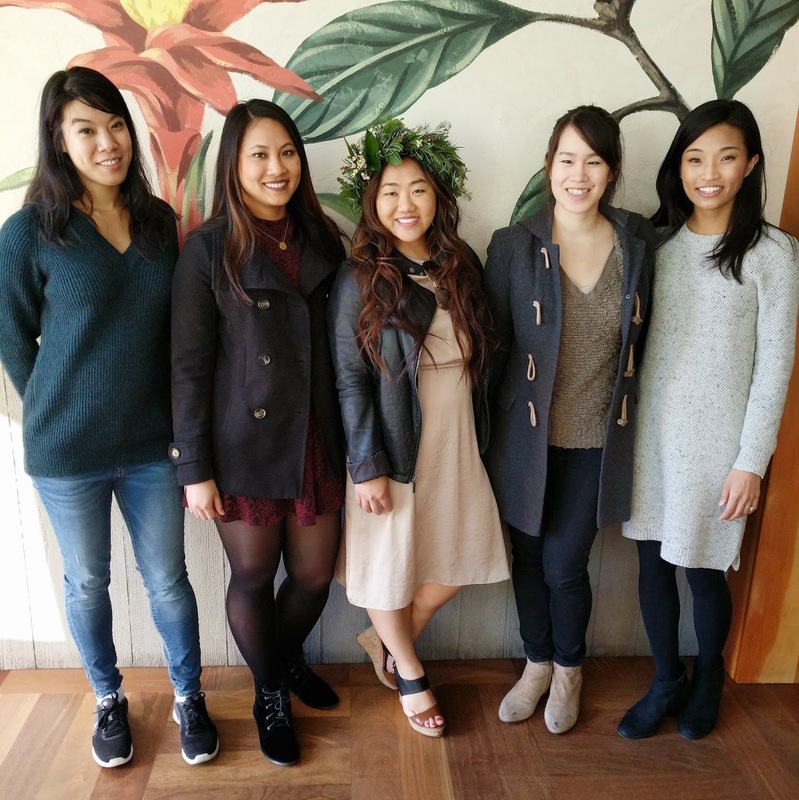 Read on for the cake recipe, and for a bean paste flowers how-to! 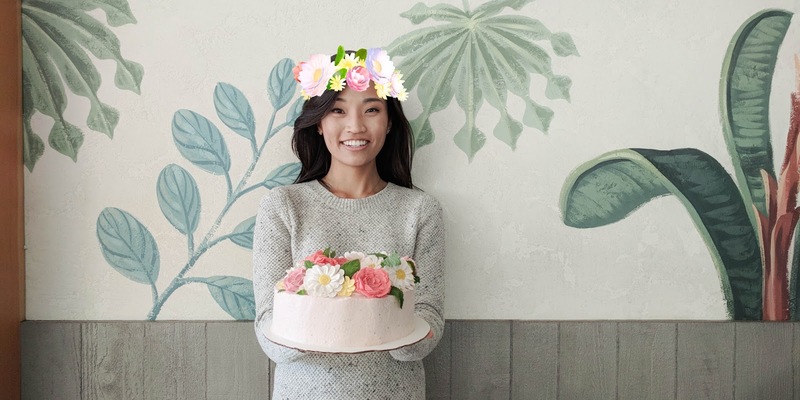 When I set out to bake a cake for my college bestie Karen, I immediately knew I wanted it to look like the Snapchat flower crown: Karen's Snaps are laugh-out-loud-at-work-and-get-a-zillion-confused-glares hilarious, and she looks great in a flower crown! Preheat oven to 350 degrees and prepare cake pans with parchment paper, shortening, and flour. Start soaking 2 cake strips in a glass or tupperware of cold water. Sift flour, salt, and baking soda in medium bowl. In bowl of mixer, cream butter and sugar until fluffy. Add buttermilk, oil and vanilla until combined. Add flour mixture and stir manually with a rubber spatula until just combined. Take the soaked cake strips out of the water and wrap them around the cake pans. Fill cake pans 3/4 way. Put berries, liquor, and juice in saucepan. Bring to a boil over medium heat and then reduce to a simmer for 5 mins. Let cool, then blend until smooth. In bowl of mixer mix cream cheese and butter until creamy. Add berry puree until smooth. Frost cakes when they are completely cooled. When it was time to decorate the cake, things got interesting. I know Swiss meringue buttercream is the gold standard when it comes to piped succulents and flowers, but I frankly loathe the way it tastes. So I scoured the internet to find alternatives and stumbled upon the concept of using white bean paste ("anggeum" or "앙금" in Korean) to pipe flowers in Korean bakeries. The result tastes something like what you'd find in the center of a red bean bun, which I find more palatable than buttercream. Plus, the flowers are vegan, and you get some fiber too. The look is not quite as polished or smooth-looking as Swiss meringue buttercream, so I might still have to resort to the stuff for future cakes. I'm super into this piping flora thing - the process is very soothing. Soak 500g white kidney beans (cannellini beans) in water for 8 hours. OPTIONAL: Peel the beans (should be pretty easy after soaking them). I've made this with skins and without them - you do get some additional smoothness from removing the bean skins, but it is very labor intensive. According to this video, you can use a blender to peel beans in 15 minutes. Boil the bean and water mixture for 30 minutes. Process beans and water in a blender. Add 250g of sugar and pan-fry with a spatula to evaporate the water. The paste is ready to be removed from heat when you can cut through with the wooden spoon and the streak holds for a few seconds. Remove from heat. Taste and adjust sweetness by adding more sugar or vanilla. After mixture has cooled to room temperature, turn in the food processor for a few seconds to get the mixture even smoother (there might be dry bits of bean in the mixture from the pan frying process, and the food processor blends it all together into a smooth, pipe-able consistencey). Divide the paste in 1~2 cups and keep in airtight containers or wrapped in plastic wrap twice. Will keep refrigerated for up to 4 days. Frozen will keep up to 1 month. The process of making bean paste is nicely documented in this video. Take about 3/4 cup of chilled bean paste and mix with a few drops of the Americolor Bright White gel food color. Scoop the colored paste into a piping bag with tip #104. Take about 1/4 cup of chilled bean paste and mix with a few drops of the Wilton Buttercup Yellow gel food color. Scoop the colored paste into a piping bag with tip #2. Put a dab of bean paste onto the flat head of a flower nail, and place a parchment square on it. The dab of bean paste is the glue that adheres the parchment paper to the nail. Pipe the center of the daisy with the yellow bean paste piping bag. Since you want this daisy to be fairly large, I piped a large quantity of paste in the center of the parchment almost until it reached the end of the paper. The diameter was about 0.75". Take the white bean paste piping bag with the #104 tip. Position the wider end of the tip toward the center of the flower. Gently pipe a petal that covers about 1/6 to 1/10 of the outer diameter of the yellow center. Repeat until you've gone all the way around the flower once. The videos on this blog post from I Am Baker are accurate visual demos on how to pipe daisies. Add a second layer of petals over your first using the same technique, but angle your piping tip slightly upward away from the nail while keeping the wide base toward the nail to give the second layer of petals a "lifted" look. Once you're done piping the flower, lift the entire parchment paper from the nail, and place it on a cutter board or cookie sheet. Make about a dozen or so of these daisies so you have plenty + backups for your crown. Freeze them on the board or sheet for at least 2 hours. For the petal piping bag, use piping tip #102 or #101, not #104. You want the petals to be smaller. For the petals, use the Wilton Lemon Yellow color mixed with the Americolor Bright White color. The daisy petals should look brighter and paler than the Buttercup Yellow center. Make the center only about 1/4" in diameter. Take about 3/4 cup of chilled bean paste and mix with a few drops of the Americolor Soft Pink gel food color for the pink roses, and combine the Soft Pink with Wilton's Christmas Red food color for the coral roses. Scoop the colored paste into a piping bag with tip #104. Follow the directions on how to pipe a rose from this video. Pop the roses into the freezer for at least 2 hours. 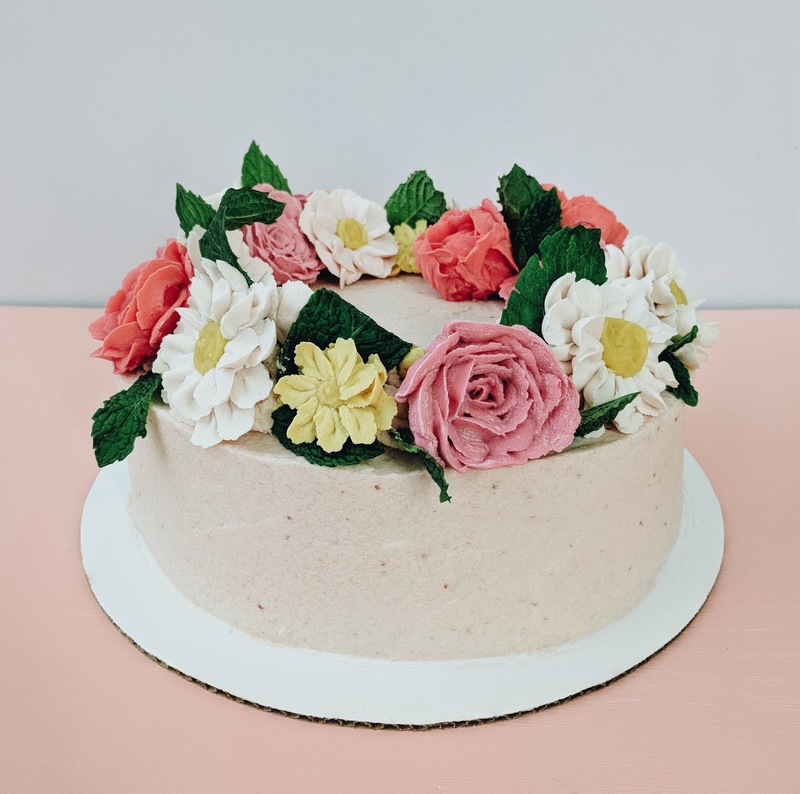 Using a #5 piping tip, use leftover strawberry cream cheese frosting to pipe a ring on top of the cake which will act as the base for your flower crown. 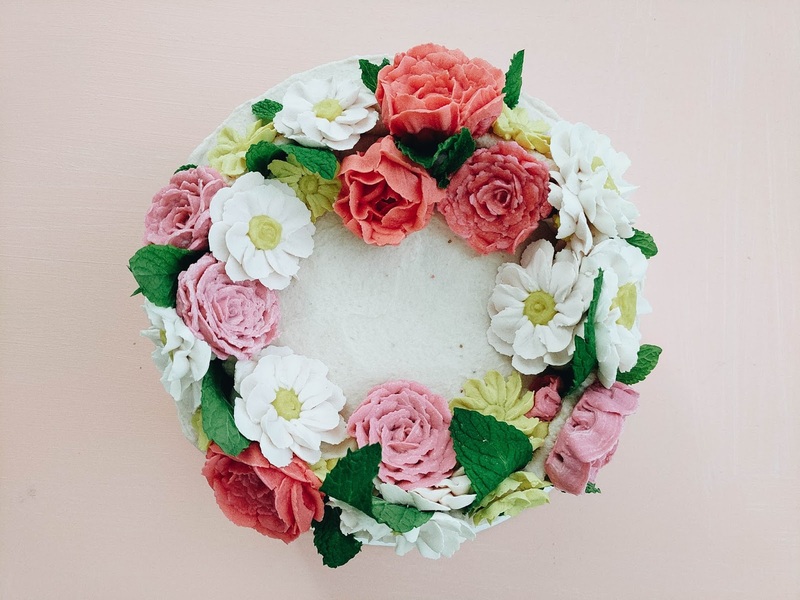 Arrange the frozen flowers (they should be hard enough to handle manually) on top of the frosting ring with the mint leaves until it resembles the Snapchat flower crown. I hope you guys enjoyed the Snapchat flower crown cake tutorial :) What kind of cake should I make next? 8 comments on "Snapchat flower crown strawberry cake for Karen's birthday"
Cake looked beautiful and yumm! Okay, frankly, this is awesome! Can you make me a cake next? You are truly talented and I would love to taste one of your cakes. They look incredibly delicious! 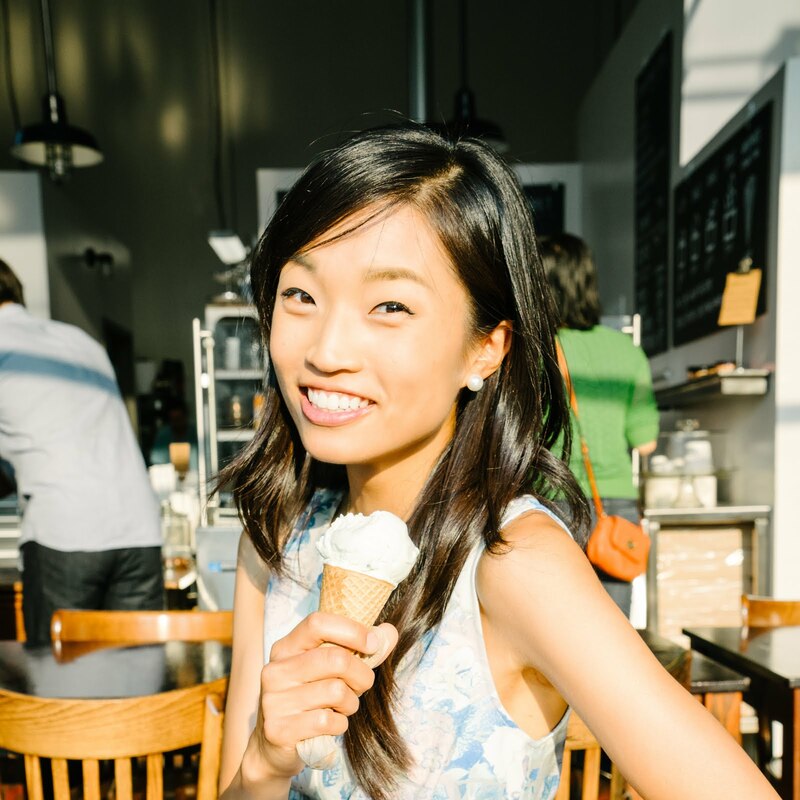 I'm intrigued by the bean paste flowers, and I would definitely be willing to give that a try! oh that looks so real and heavenly. This really is too cute to eat! lol My aunt loves to bake she will enjoy this post - I am sharing with her now!